So...Sarah Palin dropped the puck again, this time in St. Louis. At the beginning of the game, Legace trips on the rug and lets in 2 in the first, and in comes for his NHL debut...BEN BISHOP! 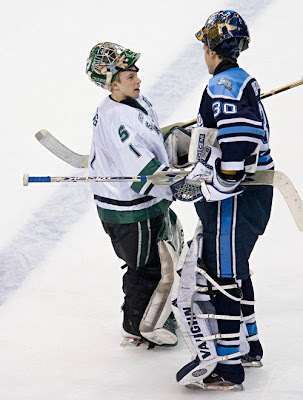 I watched Ben "Big Ben" Bishop play in a fantastic BU/UMaine overtime game last year, and I remember just being amazed with how big the guy is. He was hunched over and his backside was almost touching the crossbar. UMaine wasn't as good as BU, but Bishop kept them in the game into OT. He couldn't steal the whole game, but he was brilliant. I've liked him ever since, and watched as he got called up to Peoria and then the NHL. After his callup, it was only a matter of time before the 6'7" goalie took his place between the pipes. Yeah, he's not a Bruin. I wish. He's not even on Hockey Reference yet. Kevin Smith interviewed by Puck Daddy.